This dish took a long time to make, but it was SO worth it! I made risotto twice in the last decade, partly because it’s so time consuming. However, today I decided to go for it since we bought some beautiful wild shrimp yesterday. This is better than restaurant quality, it came out so creamy and cheesy. The risotto requires much love, so be sure you are not distracted while making this dish. Remember to stir constantly. If you are not a big fan of shrimp, leave them out and add mushrooms or peas instead. Makes a great side dish! In a small sauce pan bring chicken broth to a simmer. Keep the broth warm over low heat. Peel and devein the shrimp (if did not come already prepped from the store). Place the shrimp on a foil-lined baking sheet, sprinkle with salt and pepper. Drizzle olive oil and mix to coat all the shrimp. In a large skillet, melt butter, add olive oil, add onions and saute until tender, about 10 minutes. Add rice and let it toast lightly, add garlic. Add 1 cup of hot broth, stir. Simmer over medium-low heat until the liquid is absorbed, stirring often, about 3 minutes. Continue to cook until the rice is just tender and the mixture is creamy, adding ladle of broth and stirring often, about 35 minutes (the rice will absorb 6 to 8 cups of broth). Chop basil and add to the skillet. Add Parmesan cheese, salt, and pepper to taste. Stir to combine. Place in a preheated oven at 400 F degrees and bake 5-6 minutes. Remove from oven. 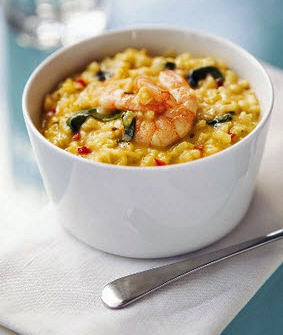 Place risotto in the middle of the plate, top with shrimp, sprinkle with extra Parmesan cheese (if desired). Serve immediately. Hi! I wanted to let you know that I nominated your blog for the Bouquet of Three Awards at http://simpleighorganized.com/2013/05/12/bouquet-of-three-awards/!